In my last tutorial i showed you how to save any web page as a PDF file . Mozilla Firefox is the most popular browser all over the world it is available on all major platform like Linux,Window and Mac.It is fully customizable people customize according to there needs but if some time some things goes wrong.It is difficult to deal with it .It crashes many time or it will take more time to load a web page .So in that case most of the people either reinstall it or uninstall it and choose some other browser.But today in my tutorial i will going to tell you how to reset default settings of Firefox.so let see how to reset Firefox to default setting’s. 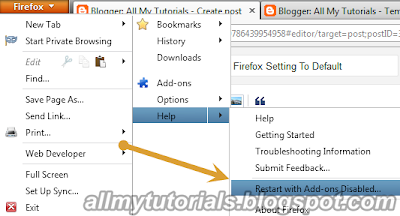 How can reset Firefox to default settings? 1.) So in the first step click on orange button on the top left most then hover to help then finally click on reset with Add-Ons disabled (See the below image). After that a confirmation box will pop up on it click on Restart . That’s it hope you like my this post , if you have any query related to this post then please leave a comment below in comment section i will try my best to help you and don’t forget to subscribe to my blog . 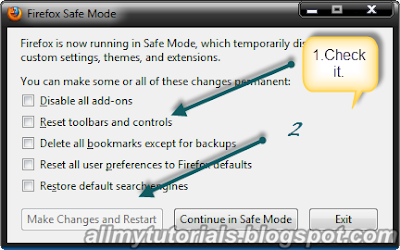 Do you know a plug-in or setting for Firefox where I can save current settings and restore the settings whenever I want?